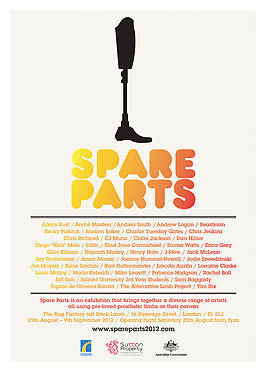 Spencer Howson: You might remember an exhibition of artworks that incorporated prosthetics – all sorts of arms, legs, eyes were painted and adorned. It was on at the Powerhouse last year. Well now the Brisbane-conceived show is going global. It’s heading to London next year and will be held at the same time as the Paralympic Games. Curator Priscilla Sutton is now on the hunt for more prosthetics to expand the exhibition. Morning Priscilla. SH: How did you get this happening? How come the show is going to London? PS: Um, it was a bit of a dare slash conversation that I had last year, where somebody asked me “would you do this again?” and I said yes, I’d love to do it during the Paralympics and they said “do it, why not?”. And here I am. SH: Here you are. What did you do, you send emails or you went over there and turned up at art galleries and say “Hey, I’m Priscilla, I’m from Brisbane, I’m here to help” or what? PS: I had many many late nights on the telephone, calling lots of different venues around London, um and basically I think an exhibition can come together if you have the idea and a venue, so that was the most important thing. SH: So the Paralympic Games is now just under, or about a year away isn’t it? PS: Yes, they celebrated a year last week, I think it was. SH: So what needs to be done then, between now and then to launch the exhibition because I think some of the art works from last year were sold, in fact most of them were sold, weren’t they? PS: Yes they were, so there are a few crowd favourites coming along, um Mr Chips who was a bit of a monster made out of an arm, I’m not sure if people will remember that, he’s coming along which is very exciting, as well as the prosthetic eye on the hat. SH: Mr Chips was the rude one, wasn’t he? SH: Yes, ok alright, don’t need to go into anymore details, he was one of my favourites. I loved seeing people stumble upon that and go oh hang on a sec, there are some rude bits on that I think and then they would walk away and come back and then they’d ask someone to take their photo with the piece of art and it was just great to watch that. PS: I think he was the most photographed piece. SH: Yeah I’m not surprised. So Mr Chips is going to London? PS: Yes, he’s coming on tour, which is very great. But yeah so in the meantime I do need to collect more prosthetics because we have to make more art work. SH: And the art, what you had was arms, legs and there was a very prominent eye that I can still sort of see a year on and then they were turned into art, who actually did the art work on them? I can’t remember how you turned them into what they ended up. PS: We had a whole bunch of um different artists involved from painters to tattooists to sculptors, so I am on the hunt for some more artists as well. Some people from last year are obviously involved again and new people but I am very keen to include more and more Queenslanders in this one. SH: Will you include any English artists? SH: So that as well. And how much publicity do you expect this to get over there, because London is a bigger city, it’s obviously a bigger art scene and this caused quite a stir here in Brisbane last year, do you think it will have the same impact over there? PS: I think it will and what’s very exciting for London 2012 is Oscar Pistorius who has been in the news a little bit lately with the World Championships in Korea, um he is the South African blade runner, double amputee. So he’s aiming to race at London 2012 at the Olympics and Paralympics, so he’s putting prosthetics in the front of the media, pretty much. So I’m hoping that a lot of media interest will actually come from that because it’s breaking down that taboo topic and getting people talking about prosthetics away from a disability, more about abilities. PS: I sure am. It’s very hard to find hands and arms, so I’m very keen for any upper body ones. I’d love more eyes because that was such a hit and they are very hard to come across as well. But any legs that people have that they’d like to donate would be great. SH: Why is it harder to find arms? PS: I think it’s only about 10% of amputees are upper limb amputees and not everyone wears a prosthetic as well, a lot of people just get by without one. So there’s not as many out there. SH: And would the same then apply for eyes, there just would be fewer? PS: I think so and I think that eye prosthetics are quite an artwork, last year if you remember that eye was attached to glasses and so a lot are in the socket as well, so there’s newer technology ones that would be great to have involved. SH: So would you try to get some celebrities on board for next year? PS: Absolutely. Adam’s leg is actually coming with us because it didn’t sell last year, unfortunately, but it’s good because it is coming to London now. But, yes there are a few famous celebrities I’ve been talking to, so fingers crossed I get some donations there. SH: If people want to get in touch with you to help you out, how do they do that? 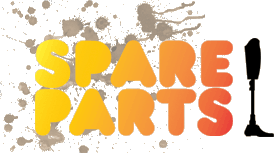 PS: You can email me on contact@spareparts2012.com and there’s also the website, facebook, twitter. I’m everywhere. SH: Very good, congratulations it’s very exciting. We’ll here more about it no doubt in the lead up to and certainly during the Paralympic Games in London next year. Priscilla Sutton, thanks for coming in. 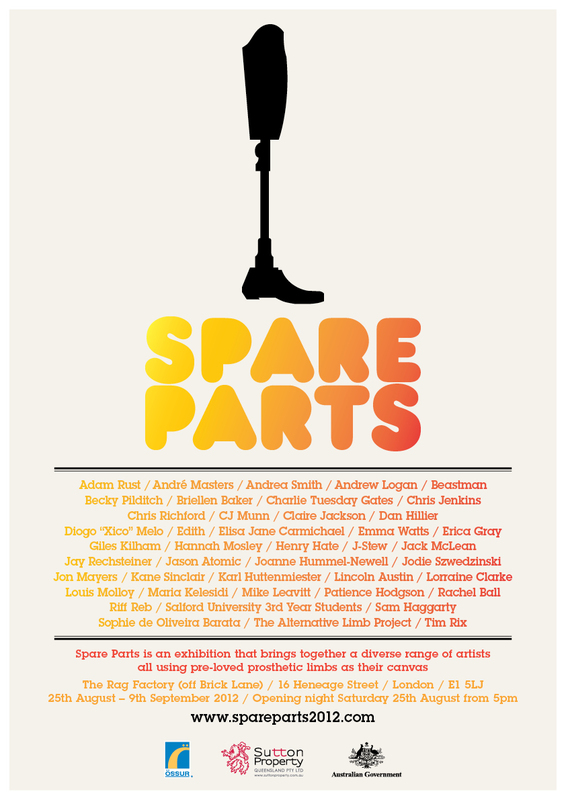 SH: Priscilla is the curator of the Spare Parts exhibition which you probably saw last year at the Brisbane Powerhouse and now, very exciting, it’s going to be showing in London at the same time as the Paralympic Games next year.